SEO Analysis is the latest Firefox addon developed by us. This addon provides the crucial data about the site / domain you are currently browsing. 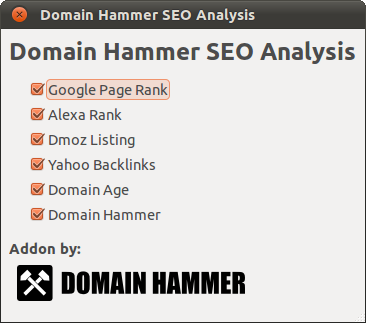 SEO Analysis is available for all current versions of Firefox, and can be downloaded for free here. Copyright © 2019 Domain Hammer. All Rights Reserved.